Saris’ new e-bike-rated rack is really versatile. 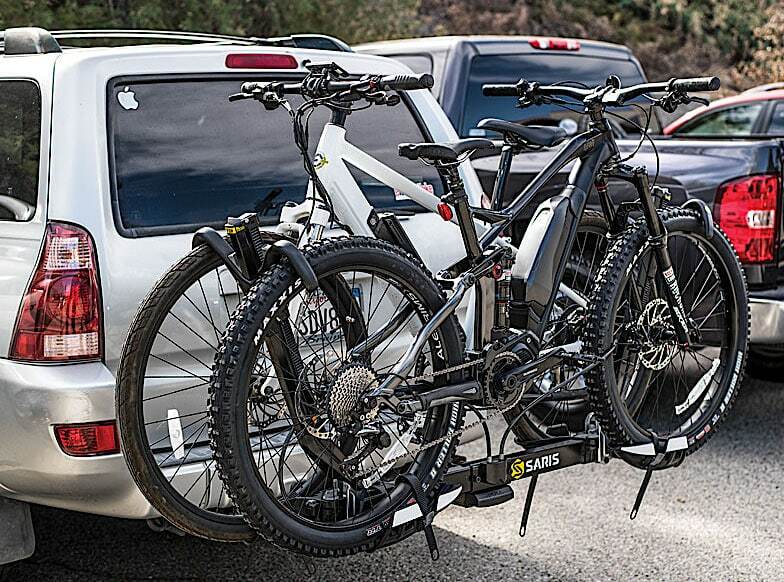 It can fit two electric bikes up to 60 pounds each. 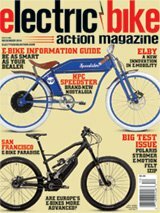 It’s definitely the most solid rack we’ve had for electric bikes so far. 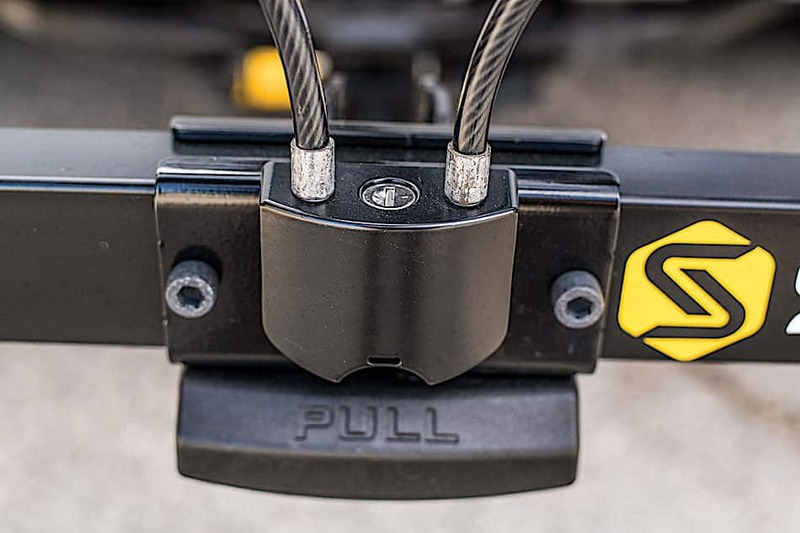 There are clamps on either end—one to hold the front end of one bike and the rear of another. It seems to work with a huge variety of bike sizes, down to 20-inch wheels, even if there’s a huge size disparity between the bikes. 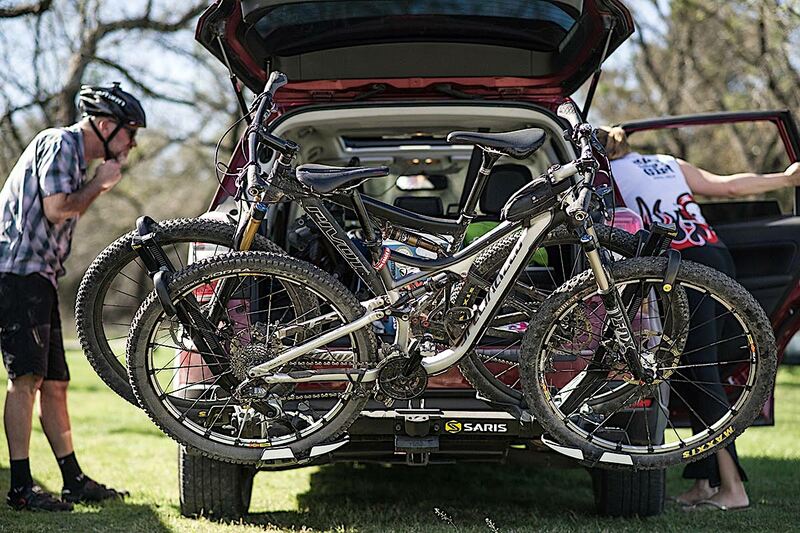 On bikes that have a rear rack, you may have to hook the rear rack instead of the wheel if it’s in the way. Their suggestion is to not use the shepherd’s hook on the fender if it has fenders, but leave it up slightly above on that wheel so it can’t bounce out (holding the wheel down with the wheel strap). Either way, you never hook the frame, and the wheels can’t pop out of the hooks since it’s hooked on both ends (and there are straps to hold the bottom of the wheels into the trays). There are two locking cables that are attached to either end. They’re enough to hold down the bikes, but a wee bit short to fully lock the frames of two bikes to the rack. You may need an external chain or cable for this, which is what we normally do. The lock and the locking hitch receiver pin are keyed the same for convenience. The rack does fold up when not in use, but it hangs pretty far back when still folded, so you may want to leave it down. The wheel trays have retro- reflective tape on them, so when the rack is flat, the rack really stands out at night. 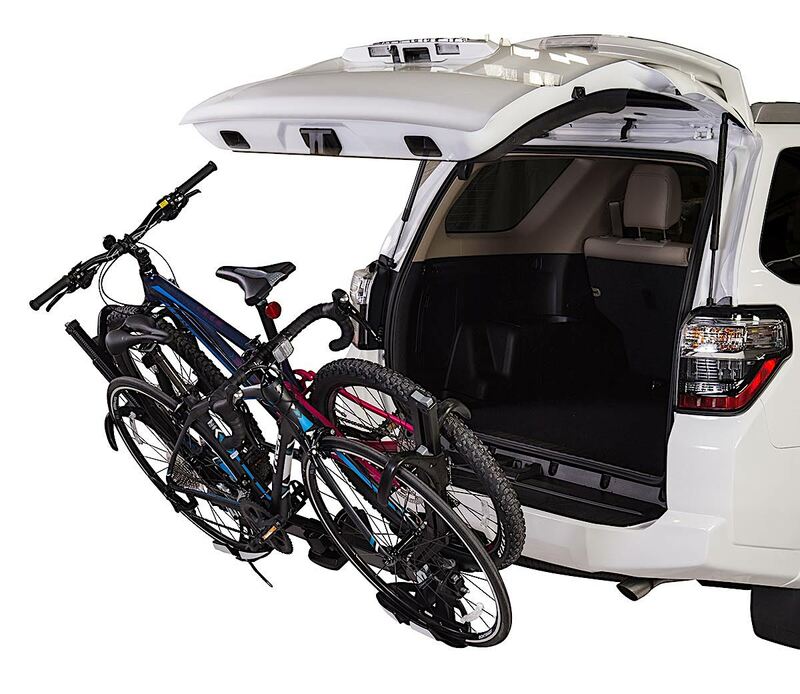 It can tilt out, too, to allow you to tilt bikes away from your hatch if you need access and don’t want to take the bikes down. We’ve loaded this thing up daily with the heaviest e-bikes, and only the really odd ones don’t fit. The cups don’t quite spread far enough for some mountain bikes, but if one wheel (e.g., the front wheel) is locked into its cup, the back wheel can hang out of the edge of the other cup and still be solidly held. You can buy replacement parts directly from Saris. We looked it up because a woman backed her minivan into the rack in a parking lot (it had no bike on it, fortunately) and broke off one of the wheel holding cups. We were actually glad that was all that was damaged, so effectively it was a $15 accident. 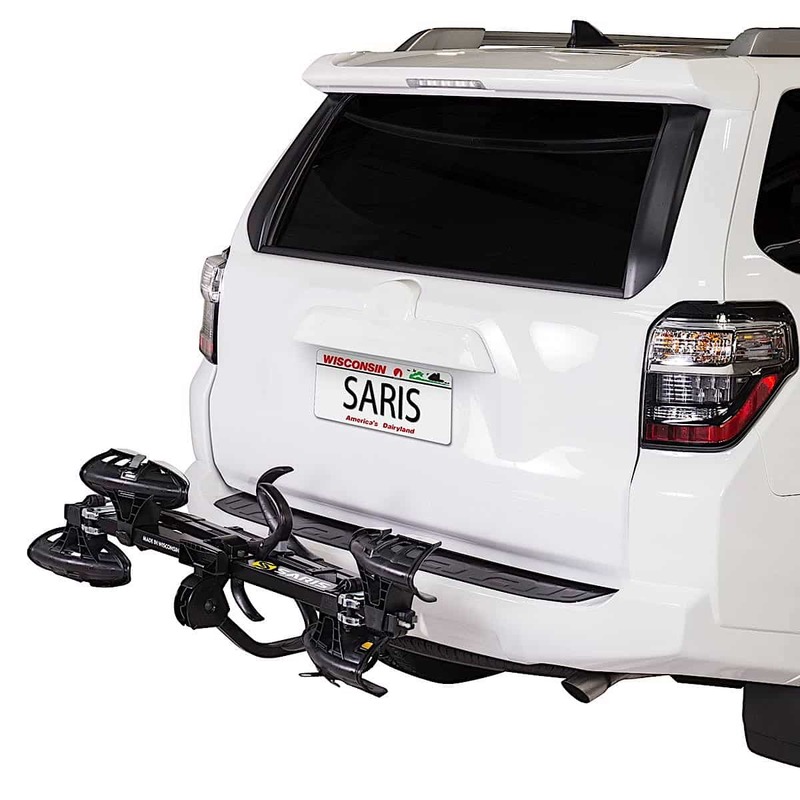 Saris also makes a four-bike version that holds up to 190 pounds, but they do specify that the two outermost bikes can’t weigh more than 35 pounds each. Saris racks are proudly made in Madison, Wisconsin, in a converted Civil War-era farmhouse. They’re busy enough to employ about 180 people and run two shifts a day.